Last fall I had read that mulberries were supposed to make a “royal purple” color, and so with much anticipation, I waited for the 4 mulberry trees on our property to produce their fruit. When finally they popped, it wasn’t great timing for me…..we were about to go on a cruise, and then I had to jump in full time with VBS. 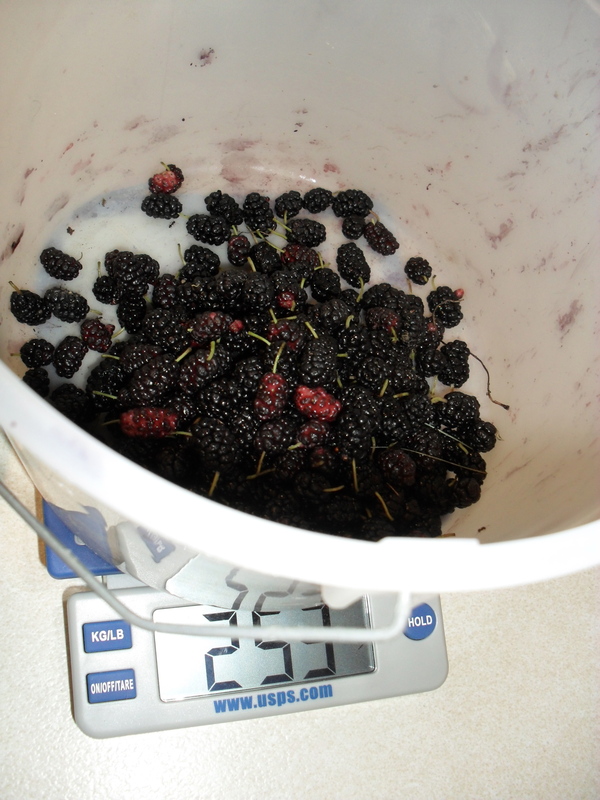 But I did manage to read up on the process and collect enough berries to make a sample and then one 250g hank. Next year, with better timing and knowledge, I’ll have more success. For better and worse, this is what I did and learned. Here I am picking the fruit, with a bucket and lanyard around my neck. I picked them from the tree and from off the ground. I thought laying down a tarp would be brilliant, but it wasn’t! Nothing seemed to fall on the tarp….did the animals eat them that fast? 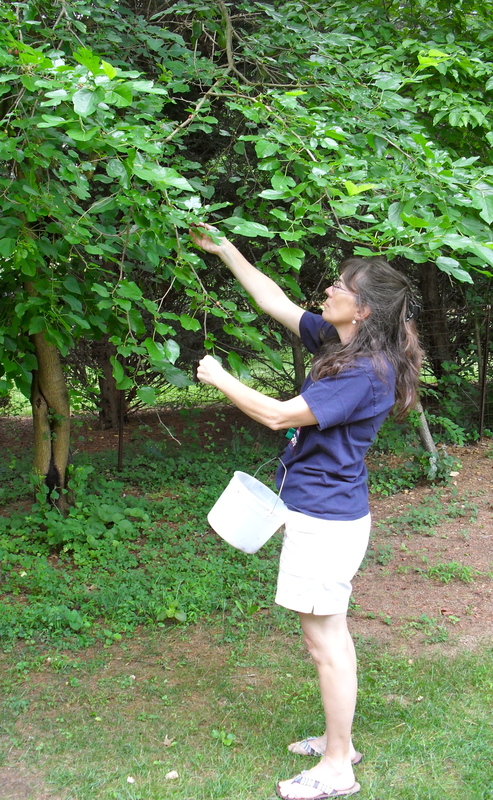 I’m not sure what to do about harvesting mulberries….you can only do so much with a ladder. Any ideas? I gathered them over a couple weeks, storing them in my freezer, until they were gone. Next, I prepared them just like the pokeberries, mashing them until they had produced as much juice as they could. 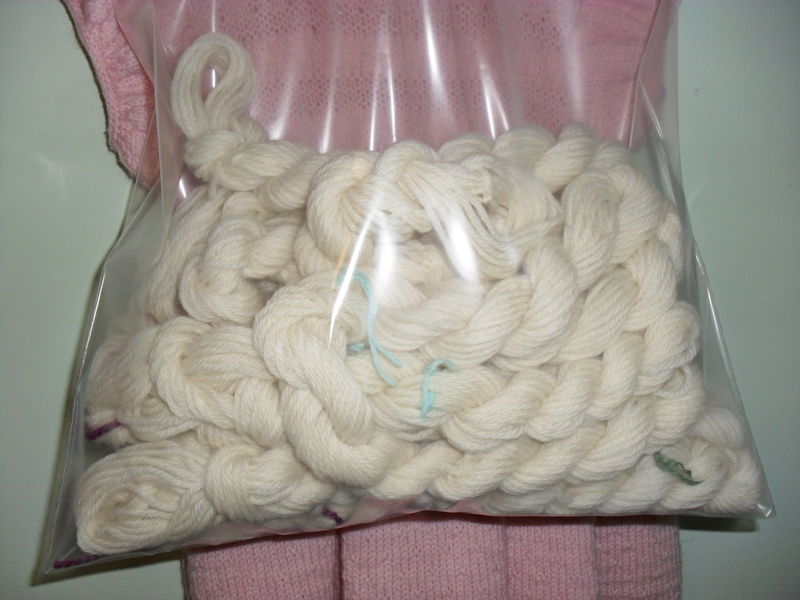 I had mini skeins all ready to go….with vinegar mordants, alum mordants, and a few with both. The sample skein I picked out had both mordants on it…..I think I did that because I did not label my mini-skeins well enough and got confused about which one I picked. It wasn’t until after I made the sample that I realized my sloppy scientific method. (Sorry, Rebecca, you just can’t get good help these days.) However, the sample looked great! It starts out red, then turns this lovely purple color. Since it looked pretty on both ends, I figured it didn’t matter which mordant I used. Logically, since it was a berry, I thought vinegar would be the right mordant. (Never mind that I READ I was suppose to use alum mordant. My mother/husband/children will tell you that I a stubborn streak.) 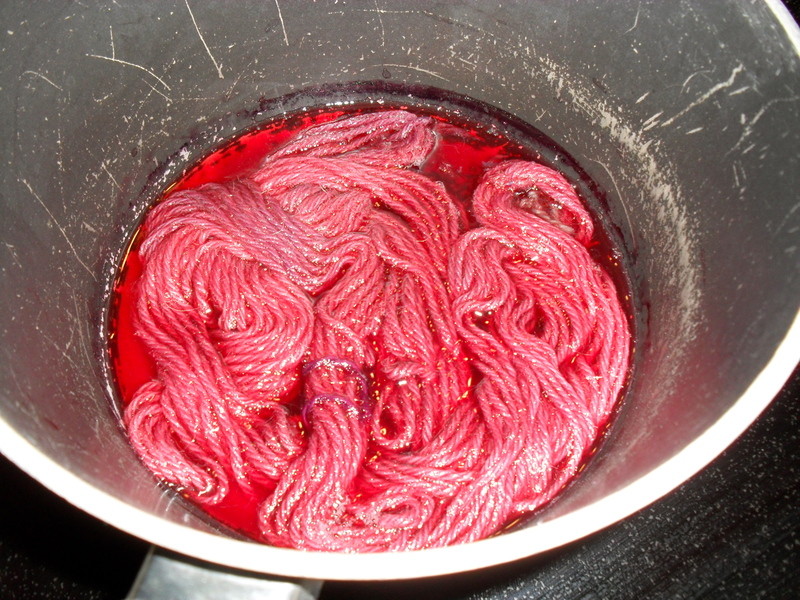 I used vinegar to mordant a 250g skein and prepared the last of my mulberries. 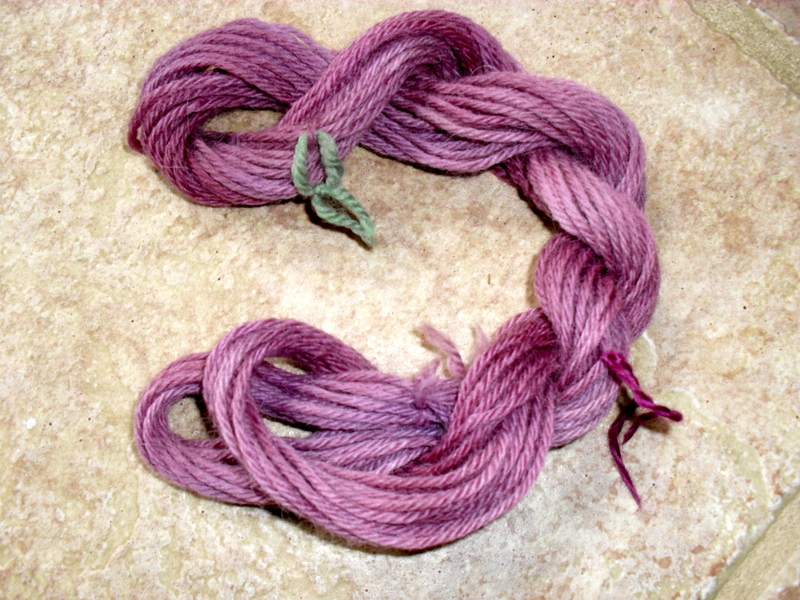 Dyed the yarn in a semi-solid fashion…..Hmmm…..I was not overly impressed….a bit grey. I did not even take a picture of it. It looks like I would have gotten the prettier purple if I had used alum like I had read. Sigh. Okie doke. 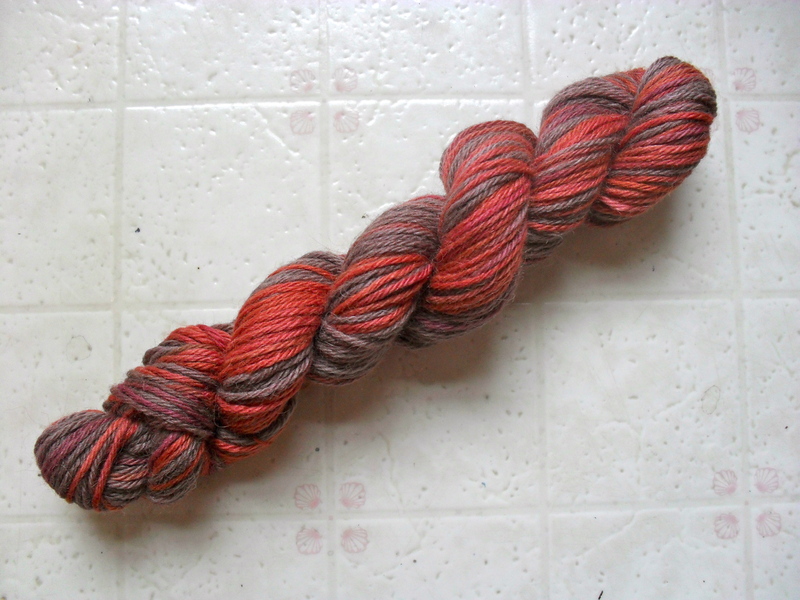 My next bright idea was to re-dye the light half of the skein with pokeberries….to cheer it up a bit. That DID help!! Here is my end result. Moral of the story: research better, follow directions better, label your samples better, but don’t be afraid to try something new.